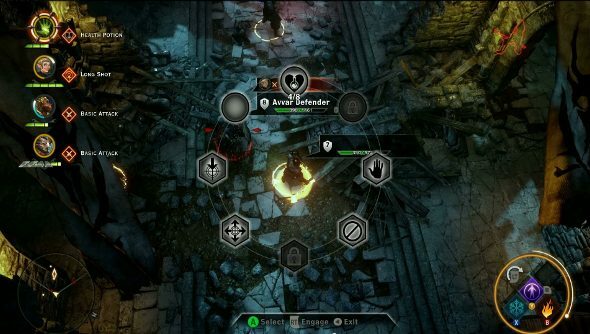 Don’t let Dragon Age: Inquisition’s month long delay get you down. Think of all the things you could do with that extra month like… watch more Dragon Age: Inquisition videos. The folks at BioWare have put together a series of videos highlighting specific gameplay features in the big ol’ dragon-slaying RPG. The first video went up today, showing off the game’s combat, both from an action perspective and a tactical one. At this point, there’s no real new information, but it’s nice to see BioWare emphasising the tactical options, and it’s a good excuse to watch the game in action. We also get a brief glimpse of the orders system that helps define characters’ roles in combat. At a glance it looks a lot more streamlined than the big menu from Dragon Age Origins, but hopefully it won’t forsake the depth. Earlier this month we got to see two developer walkthroughs based on the demo shown at E3, so between them and this new video, we’re getting a pretty good idea of how battles will work. Do you reckon it will strike that balance between violent action and thoughtful tactics?